Strengthen up your body muscles with this amazing regular physical exercise exercise. This is easy to do routine exercise. This exercise strengthens and targets the muscles of your back, but also involves a number of muscles in your arms, shoulders and chest, including your biceps and triceps. 1. 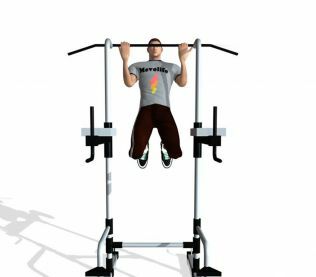 This is similar to your Chin Ups but this time, you will have to do it in a reverse manner. 2. Instead of starting below the bar, you will start here at the top. So jump and make a quick pull up, hang yourself on that bar. Then just lower yourself slowly by slowly, feeling the contraction of the muscles in your arms.